« Can blockchain unlock a sustainable future? 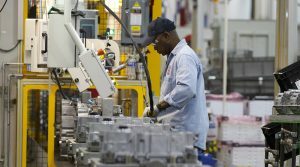 States like Ohio are demonstrating that energy efficiency in manufacturing can also lead to positive economic outcomes such as increased state revenue and the proliferation of thousands of energy efficiency-related jobs. 1) Energy efficiency employs 2.25 million people nationwide – nearly twice as many workers as the entire fossil fuel industry. 2) The United States’ industrial manufacturing sector consumed a quarter of total end-use energy in 2017. How are these two statistics related? First, energy efficiency is an important source of employment for hardworking Americans. Second, the manufacturing sector requires an exorbitant amount of power – representing the perfect opportunity to strive for more energy efficiency. From the perspective of a manufacturing company, improved energy productivity leads to significant cost savings. Every dollar not spent on unnecessary energy use can go toward other needs and help finance the development of more competitive products, fostering business expansion and job growth. Investing seed capital in energy efficiency projects allows a manufacturing company to reap dividends over time as the project pays for itself. For proof of the potential economic benefits of energy-efficient manufacturing, look no further than Ohio, a state with a robust manufacturing industry. A recent report from Synapse Energy Economics outlines actions that policymakers, investors, community leaders, and others can take to boost both clean energy and the state economy. It is no surprise that efficiency improvements in industrial manufacturing are high on that list. For example, by investing $6.6 billion to increase energy efficiency in factories and buildings through expanded programs, Ohio is projected to save hundreds of millions of dollars per year on energy, increase annual GDP by $500 million by 2030, and support 5,000 local installation, manufacturing, and sales jobs. Each 1 percent improvement in electricity productivity is equivalent to more than $6 billion in additional economic activity. Economic activity encompasses both job creation and the increased proliferation and sales of energy-efficient equipment like electric heaters, washing machines, and dishwashers – i.e. appliances that are made in (you guessed it!) industrial manufacturing facilities. Leading companies with manufacturing operations in Ohio are already enhancing the efficiency of their factories to reduce costs and meet their environmental sustainability goals. Cincinnati-based Procter and Gamble (P&G) is the manufacturer of products such as Tide Coldwater and Downy Single Rinse Pods that allow consumers to conserve energy and water in their daily lives. Fittingly, these products come from efficient manufacturing facilities like P&G’s facility in Lima, Ohio, which recently earned the Sonoco Gold Sustainability Star Award for recycling nearly 98 percent of its waste, minimizing the need to take up landfill space. Increasing productivity in the manufacturing sector means making more with less, and it is a primary driver of economic growth. Ohio businesses enhance productivity through process improvements that reduce waste—wasted time, wasted inputs, and wasted energy. According to a recent Environmental Entrepreneurs report, nearly 80,000 Ohioans work in areas related to energy efficiency deployment. From installer to engineer to architect to maintenance, these are jobs that cannot be outsourced and keep Ohioans close to home. On Energy Efficiency Day and every day, Ohio can keep its factories on the cutting edge of productivity, reduce waste, and embrace energy innovation by supporting efficiency upgrades. This entry was posted in Clean Energy, Energy Efficiency, Jobs, Ohio. Bookmark the permalink. Both comments and trackbacks are currently closed.